The interdiscipline of the science of team science (SciTS) promotes team-based research through empirical examination of the processes by which scientific teams organize, communicate, and conduct research. The field is concerned with understanding and managing circumstances that facilitate or hinder the effectiveness of large-scale collaborative research, training, and translational initiatives. This includes understanding how teams connect and collaborate to achieve scientific breakthroughs that would not be attainable by either individual or simply additive efforts. The Annual International Science of Team Science Conference brings together researchers studying team science, practitioners and leaders of team science initiatives, funding agencies that support team science, and tool developers whose products foster team science. These groups include thought-leaders from a broad range of disciplines: communications, psychology, translational research, complex systems, technology, business & management, research development, biomedical & life sciences, and physical sciences. The ultimate goal is to serve as a conduit to ensure empirical findings about team science get translated into evidence-based direction for effective team science practice and policy—a bridge between the science and praxis of team science. 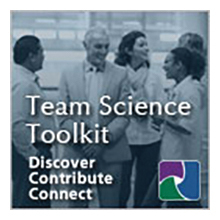 The Science of Team Science (SciTS) field encompasses both conceptual and methodological strategies aimed at understanding and enhancing the processes and outcomes of collaborative, team-based research. It is useful to distinguish between team science (TS) initiatives and the science of team science (SciTS) field. Team science initiatives are designed to promote collaborative, and often cross-disciplinary (which includes multi-, inter-, and transdisciplinary) approaches to answering research questions about particular phenomena. The SciTS field, on the other hand, is concerned with understanding and managing circumstances that facilitate or hinder the effectiveness of collaborative science, and evaluating the outcomes of collaborative science. Its principal units of analysis are the research, training, and community-based translational initiatives implemented by both public and private sector organizations. The SciTS field focuses on understanding and enhancing the antecedent conditions, collaborative processes, and outcomes associated with team science initiatives, including their scientific discoveries, educational outcomes, and translations of research findings into new practices, patents, products, technical advances, and policies. Hall K, Vogel A., Stipelman B., Stokols D., Morgan G., Gehlert S.. A Four-Phase Model of Transdisciplinary Research: Goals, Team Processes, and Strategies. Translational Behavioral Medicine. 2012 Dec;2(4). Hall K, Stokols D, Stipelman BA, Vogel AL, Feng A, Masimore B, Morgan G, Moser RP, Marcus SE, and Berrigan D. Assessing the Value of Team Science: A Study Comparing Center- and Investigator-Initiated Grants. American Journal of Preventive Medicine. 2012 Feb;42(2):157-163. Falk-Krzesinski H, Contractor, N., Fiore, S.M., Hall, K.L., Kane, C., Keyton, J., Klein, J.T., Spring, B.,Stokols, D., Trochim, W.. Mapping a Research Agenda for the Science of Team Science. Research Evaluation. 2011;20:143-156. Brainard, J. (2002). U.S. Agencies Look to Interdisciplinary Science. In Chronicle of Higher Education, pp. A20-A22. Rhoten, D. (2004). Interdisciplinary Research: Trend or Transition. Items and Issues: Social Science Research Council 5, 6-11. Huerta, M.F., Farber, G.K., Wilder, E.L., Kleinman, D.V., Grady, P.A., Schwartz, D.A., and Tabak, L.A. (2005). NIH Roadmap interdisciplinary research initiatives. PLoS Comput Biol 1, e59. Wuchty, S., Jones, B.F., and Uzzi, B. (2007). The Increasing Dominance of Teams in Production of Knowledge. Science 316, 1036-1038. Falk-Krzesinski, H.J., Börner, K., Contractor, N., Cummings, J., Fiore, S.M., Hall, K.L., Keyton, J., Spring, B., Stokols, D., Trochim, W., et al. (2010). Advancing the Science of Team Science. Clinical and Translational Sciences 3. Fiore, S.M. (2008). Interdisciplinarity as teamwork - How the science of teams can inform team science. Small Group Research 39, 251-277. Schnapp, Lynn M (2012). "How to talk to strangers: facilitating knowledge sharing within translational health teams with the Toolbox dialogue method". Translational behavioral medicine (1869-6716), (1). Matters of Team Science, the final blogpost from the SciTS Conference in April, 2010. Live discourse and dynamics analysis conducted as action research during the Conference ; Reflexivity Series: Science of Team Science, all five posts in series.